In the previous post we had a quick look at the problem of writing concurrent, asynchronous code with C++. We saw that the <future> library, introduced with C++11, offers a partial solution to this problem by separating the act of initiating an operation from the act of waiting for its result. But we saw that the act of waiting for a result is still synchronous, and that std:futures are not easily composable. We talked of the platform-specific improvements offered by Microsoft’s PPL tasks, which have become the model for a few interesting changes proposed to the C++ standard library. But are these improvements enough? Having composable futures would certainly be a big improvement for C++. But the experience with C# tells us that it’s not a perfect solution. A purely library-based solution is bound to have limitations. In particular, .NET’s TPL has the defect of making the code overly complex. It is difficult to write robust, readable and debuggable code with TPL. It is too easy to end up with spaghetti code: a large number of Task<T>s interconnected in inextricable chains of continuations. I found out the hard way, when I was given, by my last employer, a .NET component to maintain which had been architected as an incredibly convoluted graph of interconnected TPL Tasks, often joined with conditional ContinueWith(). It is particularly difficult to write iterations and branches with tasks. In my previous post I used as example a copyFile function that asynchronously read all the file content into a single string and copied it into another file. Of course such an implementation would not be practical with very large files, so let’s rewrite it so that it will read and write a file chunk by chunk. Here I am using the PPL, but very similar code could be written with std::future (especially when they will support task continuations with future::then). The problem is that this code is not much better than a purely synchronous loop of blocking calls to read and write the file; if our thread schedules asynchronous operations but then immediately blocks waiting for them to complete, we cannot really do much else concurrently. It would be better to chain a sequence of tasks that read and write the file chunk by chunk, so that they can be scheduled one after the other leaving our thread free to do other work while these tasks are blocked in some I/O operation. It turns out that writing a “task loop” correctly is not trivial, especially if there are many possible error cases or exceptions to handle. It is actually so tricky that there are MSDN pages that explains what to do, and what the possible pitfalls are, and the PPL Asynchronous Sample Pack (PPL Asynchronous Sample Pack) even provides sample code for this. It is probably easy to do better, to write cleaner code that executes in a loop a simple continuation chain like this one, but it is also quite evident that when the algorithm becomes more complicated the asynchronous code can become very convoluted. And then there is the problem of debugging: if we set a breakpoint in the file->write(…) line, for example, when the execution stops there the debugger will present us with a quite strange call stack. With continuations we lose the usual “causality chain” of return stacks, typical of synchronous code. Here the lambdas that compose the body of the tasks are scattered in the call stack, and distributed across several threads and sometimes it can be difficult to understand what is going on. The complexity of working with Tasks is well known to C# programmers, who have already had a few years to experiment and gain experience with the .NET TPL. This is the reason why the biggest improvement of C# 5.0 was the introduction of the Async/Await pattern, designed on the model of F# asynchronous workflows. Now, this is really beautiful! We did only a few small changes to the structure of the code, adding the async modifier and changing the return type of our methods, and adding a strange await keyword in the places where we call asynchronous functions. The logic of the function has not changed at all, and yet, it now executes in a completely different way. Let’s see how. Awaiting on an expression means launching the asynchronous execution of that expression (usually an async method) and, if it has not yet completed, immediately yielding the execution to the caller. So asynchronous methods are, like iterator methods, a kind of coroutine. They are resumable, their execution can “magically” pause in a few points identified by the ‘await’ statements, and then “magically” resume when the asynchronous expression has completed. While the method is paused waiting for the completion its caller continues to run. This means that if the method was called from an UI message loop, for example, the UI thread can continue processing messages, and the application will remain responsive. If the method was called by a worker thread in a web server the thread will be free to serve more requests. But just like iterator methods, in C# asynchronous methods are not really coroutines. They are instead implemented with a state machine. The details are quite complicated (a very good description can be found here and here), but what happens is that the compiler transforms the function body by attaching a task continuation to the asynchronous operation so that the execution will resume from the point where it had left. In which thread the awaitable expression executes, and in which thread the async method will resume? It’s up to the task scheduler to decide; asynchrony does not mean parallelism, a method does not need to run on another thread to be asynchronous. The scheduler may run the task later in the same thread, or it may run it on a worker thread from the ThreadPool. The execution will then resume on the right thread (for example the UI thread in a GUI app) according to the current synchronization context. For the point of view of the developer, this means that he cannot rely on the fact that an async method will continue its execution on the same thread where it started (with all the consequent multithreading headaches). So, everything is nice in the managed world of C#, but what about native programming? Is there anything like async/await that we can use with our futures? We can find the answer in N3858, another proposal made by Gustafsson et al. for C++17. This time the changes proposed are to the language itself and not just to the library. The idea is to introduce the equivalent of C# async methods in the form of resumable functions. They can be thought as the basis to add to C++ the support for real co-routines, and are not strictly related to the <future> library, even though they have being defined especially to improve the usability of futures and promises. – The resumable keyword, added after the argument list, defines a function as being suspendable and resumable, in the way described before. It is the equivalent of C#’s async. – Like in C#, the await keyword in the body of a resumable function identifies a suspension point, one of the places where the function may suspend execution and then resume it later (possibly in a different thread) when some asynchronous operation completes. This would define a resumable function that takes a future<int> as argument, suspends itself waiting for the future result to be available, and produces an integer as result. Of course, a resumable function can only return a future<T> or shared_future<T>. It completes and produces its final value only when a return statement is executed. Will this proposal be accepted? Will resumable functions become part of the standard? And is there a portable way to implement them? I really cannot answer any of these questions. But, interestingly, it is already possible to play with resumable functions today. Last November Microsoft shipped the Visual Studio November 2013 CTP with a preview of several C++ features that will be released in the next version of Visual Studio and that improve the conformance to the C++ standard. Between those, there is also the first implementation of resumable functions. To enable them we must change the “Platform Toolset” of our C++ project to use the updated compiler from the CTP, as shown in figure. Also, we need to include the new header <pplawait.h> which extends the PPL <ppltasks.h>. The syntax of CTP’s resumable functions is very similar to the one proposed by Gustafsson, with a small change in the keywords. In order not to “taint” the language with (still) non-standard keywords, async has been renamed as __resumable and await as __await. We got there! Finally we have simple, readable, maintainable asynchronous C++ code. The only small complication is that it is necessary to pay a lot of attention to the life scope of the objects passed to the asynchronous/resumable methods. In C# things are easier, but we don’t have a garbage collector here, so it is often better to wrap the objects in shared_ptr<T>s to make sure they don’t get destroyed when they are still referenced by some async task. A small tribute to pay to the Gods of asynchrony, anyway. But how would resumable functions work, in practice? To learn more about this it is interesting to study the <pplawait.h> header and to watch the interesting Channel 9 talk of Deon Brewis, from last year’s GoingNative conference. With a state machine, like in C#. With resumable side-stacks (aka Fibers). The first implementation would be similar to how async/await is implemented in C#. The compiler would transform the code of the function, implementing the logic of a state machine that keeps track of the current state of the function. The implementation would be more complicated than in C# because C++ does not have garbage collection; the function variables could not live in the stack (because the stack frame would be lost when the function is suspended), so they would have to be stored in an heap-allocated activation frame. But the second way of implementing resumable function seems more elegant: each function would have its own side stack, a stack separated by the thread stack and allocated by the compiler when the resumable function is invoked, and destroyed when the resumable function completes. What the proposal describes is actually to using something identical to Fibers, in Windows. The very, very surprising thing is, in my opinion, that Microsoft chose the second option, the fibers, to implement resumable functions in the CTP. Now, this is curious: a couple of years ago I wrote a few posts about a possible way to write C#-like iterator blocks and LINQ operators in C++ using Fibers. Fibers are an almost forgotten, old feature added to Windows NT to support cooperative multitasking, in the form of lightweight threads that must be manually scheduled by the application. If I am not wrong, they were added to Windows to improve the performance of the first versions of SQL Server. My implementation of iterator blocks was very questionable for many reasons (for example, I just copied the IEnumerator/IEnumerable interfaces from .NET rather than writing something that could work better with C++ STL) but I thought that the weakest point was probably the use of fibers. In fact it is difficult to write correct code with fibers; the entire program must be designed to support them. During the years, many things in Windows have grown increasingly incompatible with them. 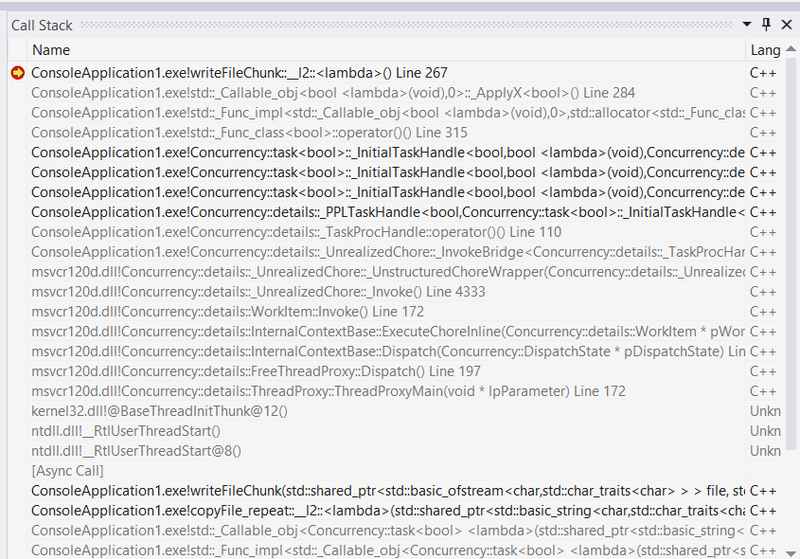 The whole .NET does not work with Fibers, and an attempt to fix this proved so complicated that was soon abandoned. Evidently this is not necessarily a problem if fibers are used in the limited scope of supporting native resumable functions, and under the direct control of our compiler. But even so, the functions and libraries that we call from our resumable function must be fiber-safe (in addition to being thread-safe); for example thread-local storage does not work with fibers. The CRT itself was not completely fiber-safe in the past, but I guess this should have been fixed by now. And there is the problem of managing C++ exceptions: in the past they could only be caught by the fiber that threw them, they could not pass across fibers’ boundaries, but even this problem can be solved by the compiler or library. Also, I wonder whether there is a portable way to implement side-stacks also on non-Windows platforms, and if some support from the OS will necessarily be required. But let’s look in more detail at the CTP code, to learn how resumable functions actually work. The implementation is split between the compiler and the library code in <pplawait.h>. LPVOID threadFiber;         // The thread fiber to which to return. The first, __resumable_func_setup_data, contains the data and logic to initialize a resumable method call, and it’s templatized on the function type. The second, __resumable_func_fiber_data, contains the data and methods to manage the life of a resumable method that runs on a fiber. the compiler generates the code for a stub function foo_resumable. The first thing to do is to convert the caller thread into a fiber, by calling __resumable_func_fiber_data::ConvertCurrentThreadToFiber(). When the function completes it will convert the fiber back into a normal thread with ConvertFiberToThread. Then, a __resumable_func_setup_data struct is initialized with the data required to invoke the function on a fiber. After this, a new fibers is created, specifying as entry point __resumable_func_setup_data.ResumableFuncFiberProc. Since creating and destroying a fiber is a relatively expensive operation, the library also implements a class FiberPool, to manage a pool of Fiber, which will be reused when needed. Now the current fiber can suspend itself and start the execution of this new fiber by calling SwitchToFiber. Calling SwitchToFiber means manually doing a context switch (or better, a fiber switch). The instruction pointer of our thread suddenly jumps to a different place, using a different stack, and all the registers are updated. But the old context and stack is not lost: it is part of the previous fiber. It is just not running, because it is not associated to any thread, but it can be resumed in any moment. 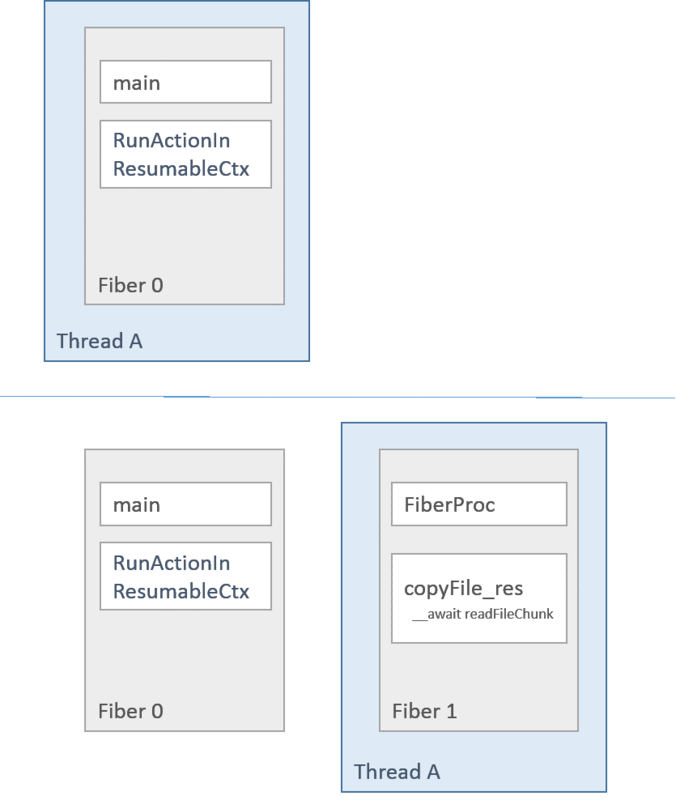 For example, the following figure shows what happens when the resumable copyFile_res is called in our copyFile program: first the current thread (Thread A) is converted into a fiber (Fiber 0), then a new fiber (Fiber 1) is created to run copyFile_res, and the thread execution is switched to the new Fiber. At that point only Fiber 1 is running. Fiber 0 still exists, with its stack, but it’s suspended. Finally executes the resumable function in the context of the fiber. – We can temporarily suspend the function on an ­­__await expression and yield the execution to the caller. In the first case, all we need to do is to complete the ResumableFuncFiberProc, store the result and call SwitchToFiber(previousFiber) to resume the previous fiber. The “terminated” fiber is now ready to be deleted or recycled. where func is a task that wraps the awaitable expression that is being called. await_task implements all the logic to suspend the current function/fiber and to yield the control back to the previous (caller) fiber, so resuming it. But before yielding the execution, await_task attaches a continuation to the task func. When that task will complete, we want to resume the current fiber, and to do this the continuation needs to retrieve and update the func_data_on_fiber_stack struct and to call SwitchToFiber once again. The actual details are a little complicated, but the whole code in <pplawait.h> is not too difficult to read. The last interesting thing to note is that the new <pplawait.h> library makes use of a new and slightly improved version of the Win32 Fiber API, defined for Windows 8.1 (where _WIN32_WINNT >= 0x0603) but actually available also on Windows 7 (at least with the most recently patched version of kernel32.dll). The difference is that a Fiber can now be created specifying different values for the CommitSize and the ReserveSize of the Fiber stack.Here ReserveSize represents the total stack allocation in virtual memory, while CommitSize is the initially committed memory; it can be useful to fine-tunes these values optimize the memory usage. In fact, programs with a large number of concurrent resumable operations could end up allocating a very large amount of memory for the fiber stacks, since a different Fiber must be allocated for each resumable function. There is also a dwFlags argument that can take the only possible value FIBER_FLAG_FLOAT_SWITCH and that it’s necessary to overcome an old limitation of the Fiber API, which in the past did not save the floating point registers in a Fiber-switch. It is not difficult to imagine that its purpose is to execute a function on the Fiber specified and return the result to the caller. We have almost completed a quick review of asynchrony in C++. But there is only one last thing to consider before finishing: asynchronous methods are very similar to iterator methods. They are, both, a kind of co-routine. We can think of an async method as a strange kind of iterator, which returns only one value, at the end, but which is able to suspend its execution as iterators do after yielding each value. Or we could think of iterator blocks as strange kinds of async methods, because they can suspend and resume execution but only returning a value to the caller. In C# the compiler implements both iterator methods and asynchronous methods transforming the code of the method into a state machine. We have seen that in C++ the proposal is to implement async methods as real co-routines, using side-stacks. So, the logical question to ask is “Can we use resumable functions to implement C#-style iterators”? Of course we can! The same proposal N3858 explains that the concept of resumable functions can be expanded to include generator functions, which would use the same kind of interruption/resumption logic to produce a sequence of values. Fibers were added to Windows NT to support cooperative multitasking. They can be thought as lightweight threads that must be manually scheduled by the application. When a fiber is created, it is passed a fiber-start function. The OS then assigns it a separate stack and sets up execution to begin at this fiber-start function. To schedule this fiber, you need to switch to it manually and when running, a fiber can then suspend itself by yielding execution to another fiber, or back to “calling” fiber. In other words, fibers are a perfect tool to implement coroutines sequencing. These two articles, from Dr.Dobb’s and MSDN Magazine, explain how to implement coroutines using the Fiber API. The MSDN Magazine article also shows how to do this in .NET (it was written before the release of .NET 2.0, so before iterators were available in C#. But actually Fibers don’t get along well with the CLR). Together with an old series of Raymond Chen’s blog posts, these articles have been the main source of inspiration for this small project. (In this article Duffy proposes another possible implementations of coroutines based on threads, which is however quite inefficient). Interestingly, a Fiber-based implementation does not have the limitations of (state machine based) C# iterators; with fibers it is possible to yield the control from any function in a stack frame. There are other problems, though. The Win32 Fiber API is quite simple. The first thing to do is to convert the thread on which the fibers will run into a fiber, by calling ConvertThreadToFiber. After this, additional fibers are created using CreateFiber passing as parameter the address of the function to execute, just as the threadProc for real threads. Then, a fiber can suspend itself and start the execution of another fiber by calling SwitchToFiber. Finally, when the application has done using fibers, it can convert the “main” fiber back to a normal thread with ConvertFiberToThread. It is difficult to write a library or framework that uses fibers, because the entire program must be designed to support them. For example, the function ConvertThreadToFiber must be called only once in a thread. Since each fiber has its own stack, it also has its own SEH exception chain. This means that if a fiber throws an exception, only that fiber can catch it. The same is true for C++ exceptions. Exceptions cannot pass across fibers’ “boundaries”. The default stack size is 1MB, so using many fibers can consume a lot of memory. The code must be “fiber-safe”, but most code is designed to be just “thread-safe”. For example, using thread-local storage does not work with fibers, and in fact Windows Vista introduced an API for Fiber local storage. More importantly, the CRT was not completely fiber-safe in the past, and I am not sure it is now. There are also compiler options to set in Visual Studio, like /GT, which enables only Fiber-safe code optimizations. In other words, as Raymond Chen put it, “Fibers are like dynamite. Mishandle them and your process explodes”. Therefore, this framework for iterators and Linq-like operators we’ll define should be used VERY CAREFULLY in real programs. Putting all these caveats aside, let’s see how coroutines can be implemented with fibers. This is the declaration of a Fiber class I created as a thin wrapper over the Win32 Fiber API. The Fiber class exposes the static functions enableFibersInCurrentThread and disableFibersInCurrentThread that wrap the initialization/termination functions. The constructor creates a new fiber object, specifying Fiber::fiberProc as the function to execute. What main does is simply to call the abstract function run, which any class derived from Fiber needs to implement. Logically this works like the sequence of nested function calls in a thread stack, but of course there is no physical stack here, and we can return back to the caller only by storing a pointer to the previous fiber and explicitly yielding control to it. Since exceptions cannot travel outside a fiber, the call to run is wrapped in a try-catch clause which tries to catch any kind of exceptions (even Win32 exceptions). If caught, data about an exception is stored, the fiber is stopped and the fiberProc ends restarting the execution of the previous fiber, inside the resume function. Here exceptions can be re-created and re-thrown in the context of the previous fiber, so effectively forwarding them back, up on the “fiber stack”. Not sure this is a very elegant workaround, but I could not find a better solution. Finally, when we have done with a fiber object, we can delete it, so releasing all the resources it had allocated and the memory of its stack. The Fiber class is the main building block in the implementation of coroutines. What is left to do is just to write classes that inherit from Fiber and implement in the virtual function run the actual coroutines code to execute. In the next posts we’ll see how to use the Fiber class to implement iterator blocks that work like in C#, implementing the IEnumerable and IEnumerator interfaces, and how to use this to reimplement many Linq operators. If you are curious, you can look at the sources of this small project. A first code drop (still quite a preliminary version) is available in this source repository on Google code. Let me know your comments and suggestions, if you are so kind to have a look.